«COMPOV» service center carries out repair of computers in Borispol with hardware and software failures of any complexity. 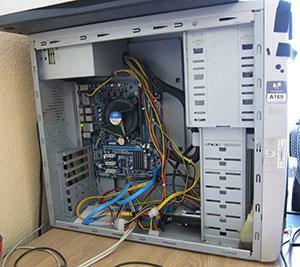 Call us at 066-425-35-18, and computer repair will be carried out quickly and efficiently. Computers, like any electronic device, will sooner or later fail. Usually computer repair takes several hours, if all the necessary parts are in stock. Why do you need the computer diagnostics? It is not always possible to clearly determine the cause of a computer failure “by eye”. In such cases the diagnostics is necessary. Diagnosis is of two types – simple and complex. With a simple diagnostics our specialist detects a fault in a few minutes with the help of the computer survey. Complex diagnostics requires disassembling and testing of each computer parts and takes several hours. The diagnostics is free in case of repairing at our service center. As there is an air cooling in the majority of computers, then a computer gets dust together with the circulating air, which collects and closes an output of hot air outside. It can lead to overheating and breakage of a computer. To clean a PC from dust, it needs to be disassembled. It is better to entrust this procedure to the professional, so you will avoid accidental breakage of a PC during cleaning. Cleaning of a PC takes 20 minutes. To prevent breakage of a computers, it is necessary to clean it from dust minimum once a year. We carry out computers repair in Borispol. Contact us, we will always be happy to help you.